TRU was host to a heated debate during the Freedom to Speak talk on Feb. 27 as part of the Freedom to Read week. 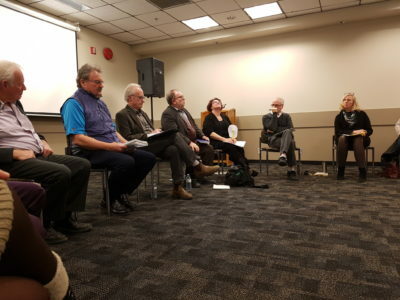 A small panel of lawyers, journalists and library workers expressed their thoughts on matters such as censorship, book bans and the role of accessibility of media while Judy Moore moderated in place of Shelley Joyce. Panellists such as Mel Rothenburger were not afraid to speak to controversial issues, saying that we must embrace censorship and self-censorship within our society, as it is crucial to our democracy. “On the one hand, intellectual freedom, freedom of speech, is essential to the operation of our democracy, but in fact if we had absolute freedom of speech, democracy would collapse,” Rothenburger said, as he started the discussion. “In all circumstances there has to be some censorship about when we can have certain conversations, and I think that’s an appropriate thing,” Lesra Martin added to Rothenburger’s point. With much debate, conversation also shifted to what individuals have the right to access. A number of panellists were in support of the easy access of any source material in locations such as libraries, no matter the contents of the published material. “My library has something to offend everybody and that’s how it should be,” Spoke Brenda Mathenia, Librarian at TRU. Jeff McLaughlin added to this point, speaking about how the internet has been used to get around bans and censorship, referring back to his teaching in Austria when a student requested a censored publishing that McLaughlin quickly found online. “Information is truly power, and it is the basis of which our democracy is built,” Mathenia added during the conversation. The event ended with questions and comments from the audience, sparking more conversations as started by members of the community.